Flamingo Pond Overlook, North Caicos. You’ll definitely won’t be able to see the flamingos up close, but it’s worth a quick stop as this overlook doesn’t have any entrance fee and is found right off the main Whitby Highway on North Caicos. The number of flamingos here vary depending on the time of year and can be in the thousands. Found off of King’s Road between Whitby and Horsestable Beach, this easy stop offers an excellent view south over the Flamingo Pond wetland on North Caicos. As the location’s name suggests, this area is typically inhabited by the West Indian Flamingo (Phoenicopterus ruber, and also known as the American Flamingo or the Caribbean Flamingo), and the flocks here are at times in the thousands. The main overlook area is about 300 feet from the pond, and the flamingos may be even farther out, so binoculars or a spotting scope will be necessary to get a really good view of the birds. This site is absolutely worth a quick stop on the chance that large numbers of flamingos are present, it however isn’t really a great spot for serious bird photography due to the difficulty in approaching the pond through the dense vegetation. 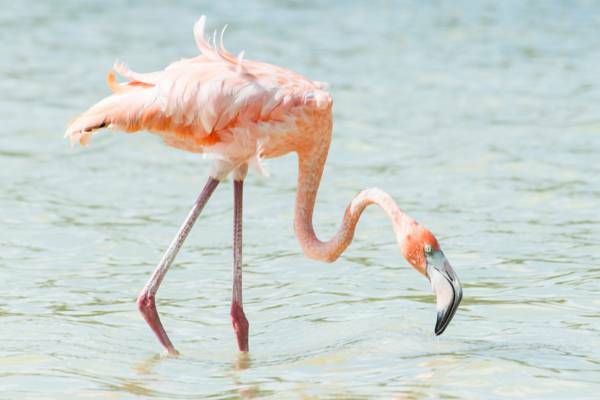 Flamingo Pond is part of the Ramsar Nature Reserve and under the law in the Turks and Caicos, anyone caught harming the flamingos or their eggs can face a stiff fine or incarceration up to six months. There’s no entry fee to Flamingo Pond Overlook. 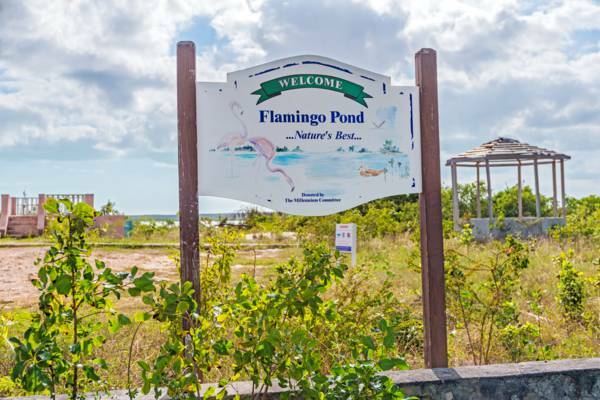 Flamingo Pond is a tidal marine pond that is somewhat connected to the Caicos Banks off the south side of North Caicos. Complex and dense networks of mangrove trees prohibit a clear waterway to the ocean, yet do allow for tide movement. The wetland system supports many of the halophyte plants (resistant to high levels of salinity) common to the Turks and Caicos, including the red mangrove, black mangrove, and white mangrove. The road sign for Flamingo Pond Overlook. It’s very easy to find the overlook and parking area. After taking the right at the T Junction from Kew Highway to Whitby highway (the main paved route through the island), the site is found 1. 2 miles (2km) down the road on the right. An impressive percentage of the Turks and Caicos is made marine wetlands, and as such, flamingos can be seen through the country. Flamingos, ducks and an osprey at the pond. If the sightings at Flamingo Pond aren’t favourable, a few other spots on the two islands may have the pink wading birds. Three large landlocked hyper-saline ponds near Whitby are the next most-likely sites to spot the birds: Pumpkin Bluff Pond, Mud Hole Pond and Mangrove Pond. These locations are adjacent to south of the unpaved road that leads from Sandy Point to Whitby (the route to Three Marys Cays). See Maps of North Caicos. On Middle Caicos (connected to North Caicos by a driveable causeway) near Bambarra, the long and narrow Montpeller Pond is another great spot and directly adjacent to the highway. A tall and dense wall of trees acts as a blind, making this location one of the better flamingo photography spots. When approaching Bambarra from Conch Bar, Montpeller Pond can be found a short distance on the left after passing the prominent Y junction (where right is the continuation of the paved road, and left is unpaved). Another scenic landscape and great spot for bird life is the extensive and muddy Haulover Ponds between Haulover Plantation and Haulover Point Beach. It doesn’t do much good if you’re on North Caicos, however, serious birders and nature photographers can try other spots in the country in the quest to sight flamingos. 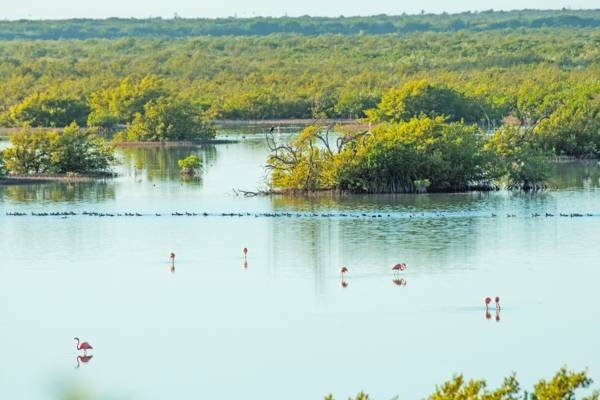 The remote Lake Catherine on the uninhabited West Caicos is the best location in the country for flamingos. Next up are the salinas on South Caicos, which may be less likely to have the birds, but are a better photography spot due to the ease of access and approachability of the flamingos. The salt ponds and salinas of Salt Cay and Grand Turk can also offer decent sightings. Providenciales does get flamingos, however the best spots tend to be difficult to access.